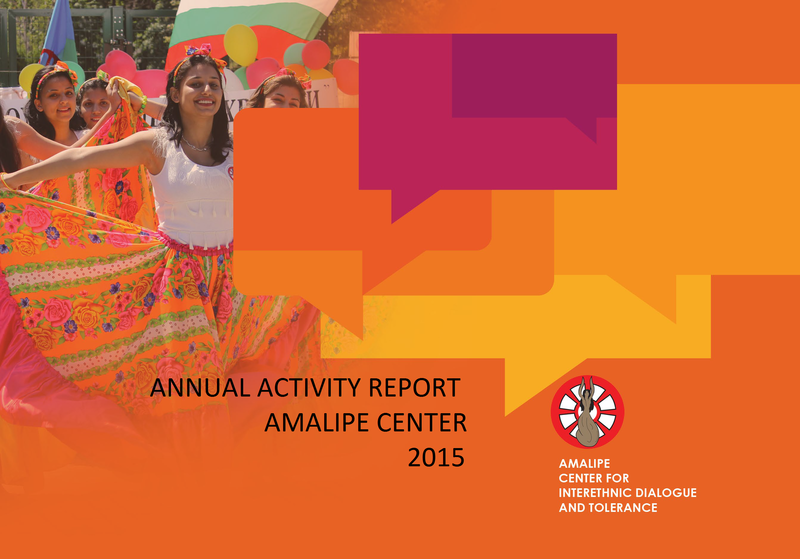 The annual activity report of Amalipe Center presents the development of the organization in 2018. It contains information on the major programs, implemented projects and activities results. Opinions of a wide range of participants in the activities implemented, politicians, teachers, students, representatives of local communities, colleagues from other Roma organizations, are applied. The report also contains information on the budget and annual financial statements. 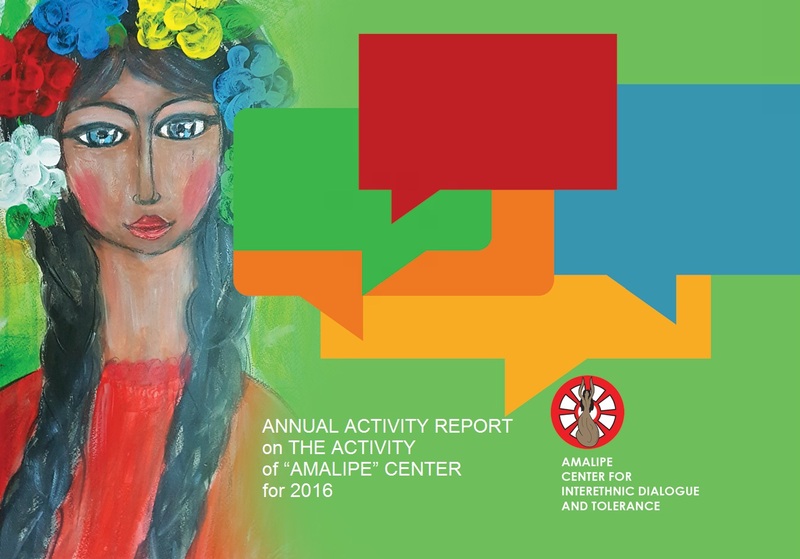 The annual activity report of Amalipe Center presents the development of the organization in 2017. It contains information on the major programs, implemented projects and activities results. Opinions of a wide range of participants in the activities implemented, politicians, teachers, students, representatives of local communities, colleagues from other Roma organizations, are applied. The report also contains information on the budget and annual financial statements. The overall report development was coordinated by Center Amalipe. This report has been prepared as part of the Roma Civil Monitor pilot project, ‘Capacity-building for Roma civil society and strengthening its involvement in the monitoring of National Roma Integration Strategies’. The pilot project is carried out for the European Commission, DG Justice and Consumers. It is coordinated by Central European University (CEU) and the Center for Policy Studies (CPS) in partnership with the European Roma Grassroots Organisations Network (ERGO Network), the European Roma Rights Centre (ERRC), the Fundación Secretariado Gitano (FSG) and the Roma Education Fund (REF), and is being implemented with around 90 NGOs and experts from the 27 Member States. The annual report on the activities of Center "Amalipe" presents the development of the organization in 2016. It contains information on the major programs, implemented projects and activities results. Opinions of a wide range of participants in the activities implemented, politicians, teachers, students, representatives of local communities, colleagues from other Roma organizations, are applied. The report also contains information on the budget and annual financial statements. The annual report on the activities of Center "Amalipe" presents the development of the organization in 2015. It contains information on the major programs, implemented projects and activities results. Opinions of a wide range of participants in the activities implemented, politicians, teachers, students, representatives of local communities, colleagues from other Roma organizations, are applied. The report also contains information on the budget and annual financial statements. The present paper evaluates the implementation of the National Strategy of the Republic of Bulgaria for Roma Integration in 2015. It is done by AMALIPE Center for Interethnic Dialogue and Tolerance as contribution to the annual assessment of the NRISs carried out by DG Justice of European Commission. The paper complements the evaluation template required by DG Justice. The present book is continuation of the debates that started during the Hearing “European funds for Roma integration” held in Brussels on March 16, 2015. It concentrates on 3 of the EU countries with bigger Roma population, namely Bulgaria, Romania and Spain. 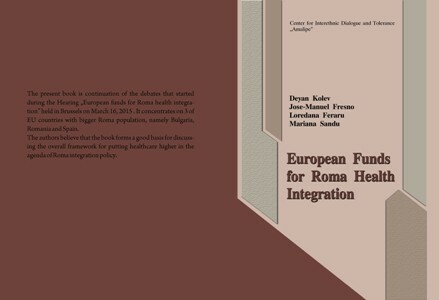 The authors believe that the book forms a good basis for discussing the overall framework for putting healthcare higher in the agenda of Roma integration policy. The annual report on the activities of Center "Amalipe" presents the development of the organization in 2014. It contains information on the major programs, implemented projects and activities results. Opinions of a wide range of participants in the activities implemented, politicians, teachers, students, representatives of local communities, colleagues from other Roma organizations, are applied. The report also contains information on the budget and annual financial statements. This assessment evaluates the impact of the project “Every Student Can Be a Winner” which was implemented by the Center for Interethnic Dialogue and Tolerance “Amalipe” (Amalipe). Amalipe is a partner and grantee of America for Bulgaria Foundation (ABF), and, subsequently, since its inception, of the Trust for Social Achievement (TSA). The project, which is the subject of this assessment, is a continuation of a previous project implemented by Amalipe in over 200 schools from 2010-2013. The assessment was done by two independent sociological agencies. It covered two groups of schools: schools included in the project and “control group” of schools that were not included in the project but work in similar environment. We started our journey in Chicago, where we had the chance to see how different ethnic communities struggle to both integrate as well as preserve their identity. Some of them had a lot of similarities with the Roma. We were able to borrow ideas from them all, which we will adapt to improve our work in Bulgaria. Our first meeting was with Dr. Alaka Wali from the Field Museum (http://www.fieldmuseum.org/) in Chicago who acquainted us with the experience of the Peruvian organization ARAA/CHOBA-CHOBA. They try to incorporate and connect community values with schooling. Ecology is a key method used in their extracurricular activities with children. A similar approach was used by the American Indian Center in Chicago (http://aic-chicago.org/), where we met with Adam Kessel and Megan Bang on October 22nd. The American Indian Center (AIC) in Chicago is the oldest urban Native American center in the nation. AIC acts as a primary resource for urban American Indian culture and utilizes a land-based education program to attract children. Our discussion there continued for more than two hours. We found many similarities between Native Americans and the Roma. We were especially interested in their successful promotion of fellowship between Indian people of all Tribes living in metropolitan Chicago. They have also managed to maintain cultural values and to foster educational advancement of Indian people by engaging school groups and introducing a land-based curriculum and garden, which they use to make a connection between the children’s current urban environment and their historical past. We discussed our experience in Bulgaria, and came to the conclusion that both approaches could be combined and that we could both benefit from the lessons we have each learned when working with schools. Education is an area in which Center "Amalipe" is working since its foundation. The main cause of Center "Amalipe" is to transform the school into a place where every child can find himself, a place where every child can start to believe that he might be winner, a place to get a chance to dream and to be a man! Every child can be a winner! If you make a child to believe that he can succeed and sincerely strive for it, you have managed to find the key to success in its development - from there on no one and nothing can stop him to achieve it. This is the basic approach that “Amalipe” applies within the three-year program for Reduction of Roma children drop out of school, organized with the support of the Foundation "America for Bulgaria". 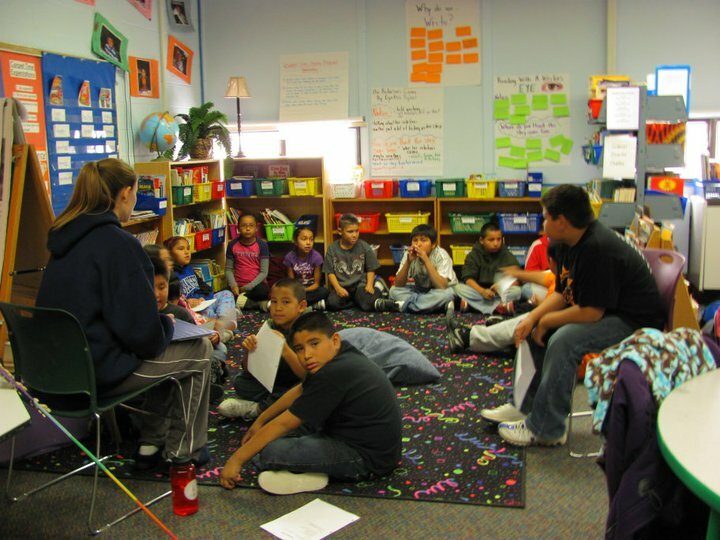 A major element of this approach is the introduction of intercultural education (with a focus on the introduction of classes on "Ethnic Folklore - Roma folklore") as a means of preservation and renovation of the cultural identity of the Roma community, as well as mutual understanding and formation of tolerance between children of different ethnicities. This publication presents the results of experience of Center “Amalipe” and the schools, involved in the program during the last three years - both in numbers and as specifically solved cases. 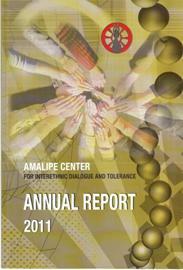 The annual report on the activities of Center "Amalipe" presents the development of the organization in 2013. It contains information on the major programs, implemented projects and activities results. Opinions of a wide range of participants in the activities implemented, politicians, teachers, students, representatives of local communities, colleagues from other Roma organizations, are applied. The report also contains information on the budget and annual financial statements. The aim of this manual is to serve practitioners and stakeholders in the field of education and intercultural learning. It is designed also for all the people interested in the biggest European minority: the Roma minority – its history, culture and worldview. It would not give you answers to all questions about Roma but it will give you a basis for further research; it will give you a starting point for reconsidering stereotypes and myths about Roma; and last but not least, it will give an orientation tour in the Roma world view. The manual has been produced within the project "Contribution to the Role of Education - Educating Educators" (CORE) financed within the Lifelong Learning Program of DG Education and Culture of the European Commission. 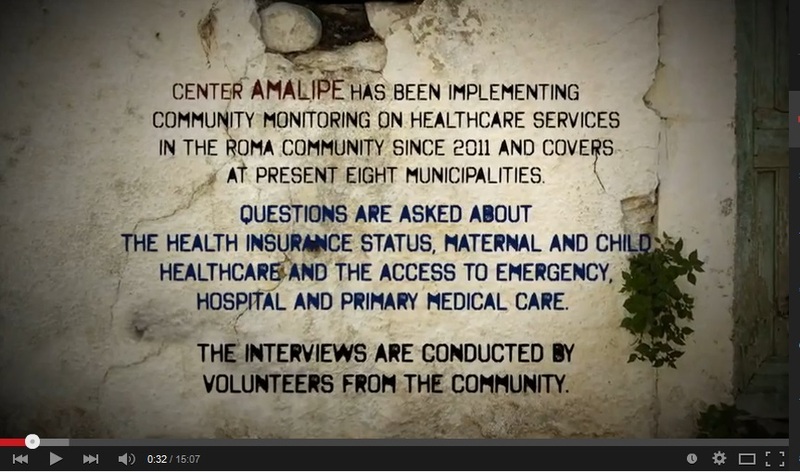 The movie presents the process of Community monitoring on healthcare services implemented by Center Amalipe in Bulgaria with the financial support of Open Society Foundations. 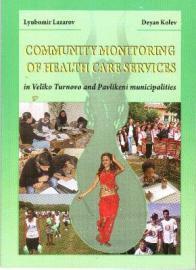 The model follows the methodology of community monitoring through the so called ‘community inquiry’, including periodical (twice in the year) consultation with the local communities about the health services they receive and their quality. We supplemented this with two more elements. The first one is the community mobilization and building groups of activists in the community which precedes the ‘community injury’. During the recent years, the program has achieved its goal to create, test, and evaluate a mechanism for mobilizing the local community in seven different towns and villages on the territory of Veliko Tarnovo, Gorna Oriahovica and Pavlikeni. The results show that the method works successfully for the mobilization of the local communities for solving issues in the field of healthcare. The second element is the advocacy activities before the local and regional health institutions as well as community campaigns for improving the health awareness. All activities are accompanied by the work of juvenile and female groups which is an important part both of the community mobilization and the advocacy. On 28 of November 2014, the European Commission approved the "Human Resources Development" Operational Programme, making it the first approved Operational Programme for Bulgaria for the period 2014 - 2020. It outlines how the European Social Fund can be used to achieve smart, sustainable and inclusive growth in several key areas: labor market (incl. youth employment, education and training, combating unemployment), social inclusion (incl. Roma integration, deinstitutionalization, development of modern social services and social economy) and modernization of public policies. The present article analyzes the text of the "Human Resources Development" OP, related to the issue of Roma integration. It examines the strengths and weaknesses of the approved program and proposes concrete actions to secure the European Social Fund for the implementation of integration policies. 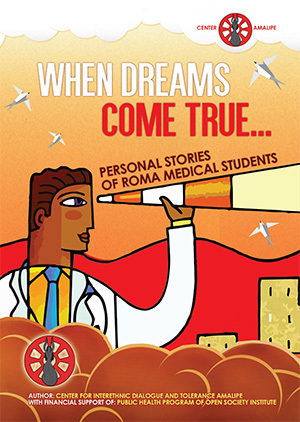 “When dreams come true…” - Personal stories of Roma medical students. What is a dream? A vision for the future, that captures your entire heart and at the deepest level, your spirit and soul. Open your mind up to the awesome power ofyour creative imagination. This book tells the personal stories of students of Roma origin who study in different medical universities in Bulgaria. They share the difficulties that they had in the process of education but also the successes they have achieved. Some of these are feel-good stories, but others are rather sad… Nevertheless, all those show the great determination to education and success of group of young people who chose their future to be devoted to healthcare. What were their motives and good role models you will find out in the narratives of the students themselves as well as their desire to be the role models for the ones to follow them. The book also gives information about the Roma health scholarship program for university students and the advocacy training organized annually by Center Amalipe. During the week-long program the young people worked on developing crucial skills for their future work of people who will bring tremendous change in their community. This is why we called them The White Swallows! You can read their stories here. 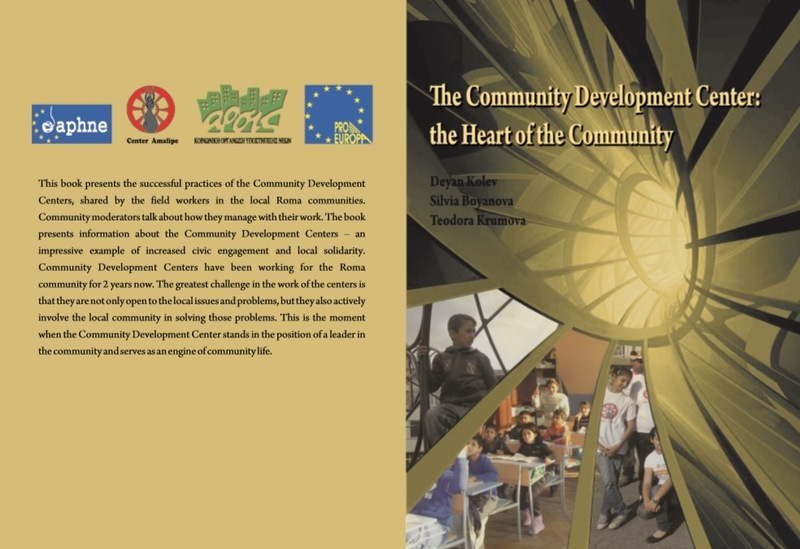 The present report outlines the main results and conclusions from the implementation of the project Promoting Participatory Fieldwork at Grass-root level in Marginalized and Traditional Roma Communities, implemented by Amalipe Center for Interethnic Dialogue and Tolerance (Bulgaria) in partnership with Liga pro Europa (Romania) and ARSIS (Greece) and financed by the European Commission within the Daphne III Programme. The idea of this project emerged in 2010. During the cycle of trainings of social workers and teachers from Bulgaria, Romania and Greece the trainees shared on many occasions their opinion that the institutions failed to perform successful fieldwork, when it is about Roma. Often, the social workers are not welcome and when they visit a Roma quarter/neigh- bourhood, they encounter an invisible yet, very firm barrier of mistrust failing thus to resolve many of the field cases. When it is about occasions of domestic violence or the problem concerns traditional practices (such as early marriages, arranged marriages and so on) among Roma, the so- cial workers’ failure is almost a hundred percent guaranteed, which makes them not to respond to such signals. Not to mention that it is extremely rare that someone would signal them, at all. They don’t perform preven- tive work, because they regard it as doomed to failure: one cannot do prevention at minimal or even lower levels of trust. Exactly the same find- ings and assessments were registered as a result from the national inquiry involving all Departments for Child Protection in Bulgaria, and orga- nized by Amalipe Centre and the State Agency for Child Protection. TO TOUCH THE UNTOUCHABLES: COULD THE ANTI-ROMA STEREOTYPES BE COMBATTED? The officials and field workers in the sphere of public services (especially in the sphere of education, health and social care) from countries with significant number of Roma population often share deep prejudice against the Roma people. For some countries like Bulgaria and Romania, this prejudice roots in the traditional stereotypes even since the Middle Ages, when the Roma people were called "the untouchables", i.e. the people, who nobody should even touch. In other countries, especially the ones in Western Europe, where Roma immigrants recently increase in number, these stereotypes are new. Nevertheless, they have one and the same result: the Roma citizens face discrimination and the public policy for Roma integration has no public support that appears as strong obstacle that prevent its implementation. The service providers (especially in the field of education, health care and social inclusion) could not fulfil effectively their job in Roma community and the Roma citizens could not receive quality services. 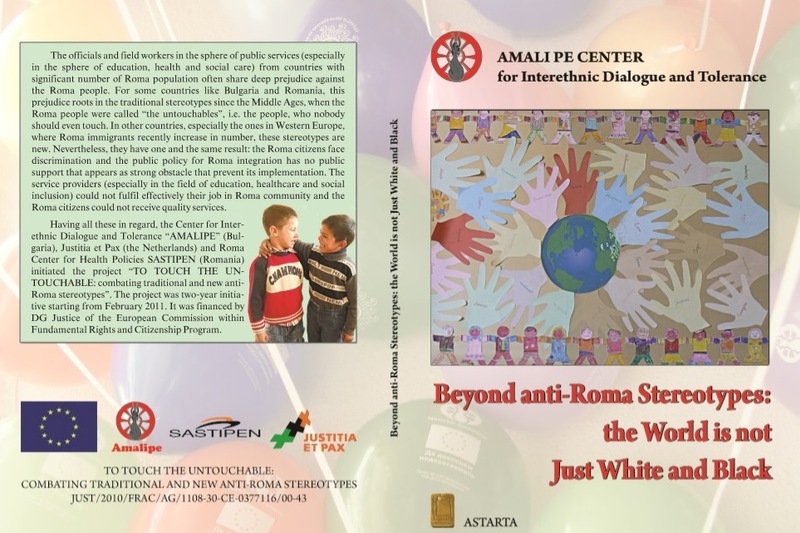 Having all these in regard, the Center for Interethnic Dialogue and Tolerance “AMALIPE” (Bulgaria), Justitia et Pax (the Netherlands) and Roma Center for Health Polocies SASTIPEN (Romania) initiated the project “TO TOUCH THE UNTOUCHABLE: combating traditional and new anti-Roma stereotypes” . The project was two-year initiative starting from February 2011. It was financed by DG Justice of the European Commission within Fundamental Rights and Citizenship Program. The idea of the project was to fight against racism and anti-Roma attitudes, based on traditional and new stereotypes among the people providing public service in the sphere of education, health and social care. It aimed to fight traditional and new anti-Roma stereotypes on behalf of educational, social and health field workers in Bulgaria, Romania and the Netherlands, as well as to encourage the mutual understanding and intercultural dialogue between Roma communities and field workers, following principle № 3 of the conclusions of the European Council dated 8th June 2009. Main purpose of the project was to create a model for efficient usage of public services by Roma people, which should guarantee that all members of vulnerable communities enjoy their main rights. - Change in the way of thinking and the negative stereotypes on behalf of Roma communities towards state employees and field workers. - Creation of a model for cooperation with Roma community, following principle 10 of the conclusions of the European Council dated 8th June 2009 "Active participation of Roma people". The first European Commission assessment report about the implementation of the National Roma Integration Strategies in all EU member states is expected to be adopted in spring 2014. In October 2013 the EC invited all interested stakeholders to contribute. Special template for contribution was announced. The present report is prepared by AMALIPE Center for Interethnic Dialogue and Tolerance as answer to the EC call for contributions. 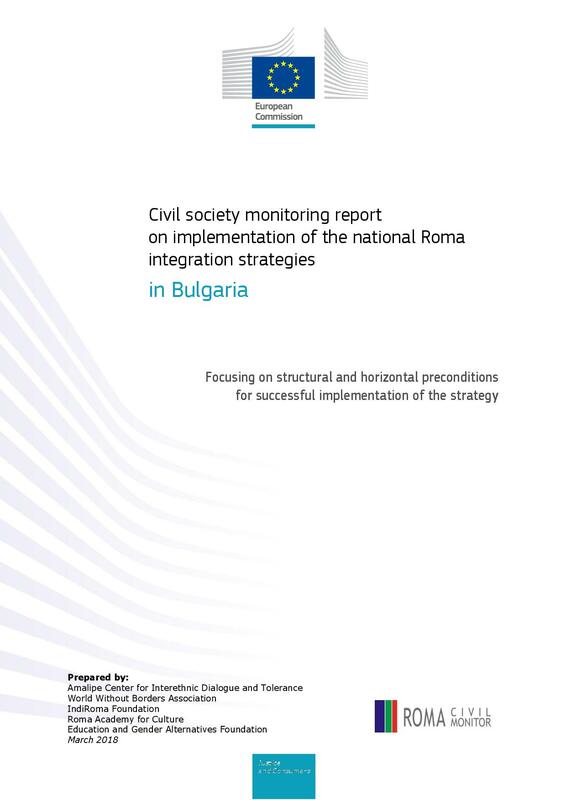 It evaluates the implementation of the National Strategy of the Republic of Bulgaria for Roma Integration during 2011 – 2013 in the light of the general and country specific recommendations set by the EC Communications . The report follows the EC template for contributions. 3. To create a network that unites the efforts of thousands of Roma people and friends of Roma people - energy that can turn the wheel of Roma integration. The increased scope of work led to increasing the organization\\\'s employees - from 28 in 2011 to 42 in 2012. It is Amalipe’s pride that our employees work with employment contracts, following the requirements of the labor legislation. They work as a team in which each person performs a specific task and assists the others, Amalipe’s faces contributed to the success of the ongoing initiatives. The organization also relies on more than 90 volunteers who were systematically involved in activities and campaigns. They are organized in voluntary clubs (Club \\\"K-7\\\" - Veliko Tarnovo, youth clubs created at most of the community development centers), they became a driving force and a face of most campaigns. Young people wearing Amalipe Center T-shirts, became a symbol of the awakening community life in dozens of villages and towns. One hundred and thirty experts and field workers from different areas were involved and also participated in the organization’s activities. Colleagues from the local Roma organizations have contributed to the good work of the Community Development Centers. Experts from the Regional education inspectorates, regional health inspectorates and regional directorates Social Assistance in 6 districts participated in the Cross-sectoral impact teams that train teachers, health and social workers to effectively work in the Roma community and resolve specific cases that require interaction between different institutions. Dozens of other experts were involved in the activities organized by Center Amalipe nationwide. This way we united the efforts of Roma and non-Roma in order to achieve the mission of intercultural dialogue, tolerance and friendship. Education has been a priority area of work for Amalipe Center since its establishment and in this respect our contribution is indisputable. Our main goal is the introduction of intercultural education as a means of preserving and renewal of Roma children’s cultural identity, as well as fostering mutual understanding and tolerance between children from different ethnic groups. CENTER FOR INTERETHNIC DIALOGUE AND TOLERANCE ‘AMALIPE’ is a leading Roma organization, which works for equal integration of Roma into the Bulgarian society. The organization has implemented activities to improve education, health and socio-economic status of Roma at local and national levels and it plays a central role in organizing the Roma civic movement and in the implementation of advocacy activities to the authorities. Center ‘Amalipe’ is a member of the National Council for Cooperation on Ethnic and Integration Issues and of the Interministerial Task Force for Resources Provision of Roma Integration. The organization is represented in the Board of the Center for Educational Integration of Children and Students from Ethnic Minorities (CEICSEM) - structure of the Ministry of Education, which realizes Roma integration activities in the field of education. The condition and tendencies in the health status of the nation, including the persons belonging to ethnic minorities, can be evaluated considering the demographic process, illnesses and risk factors, the physical growth and capability, as well as, the self health assestment. Main reasons for the health impairmant of the Bulgarian citizens, espesially Roma people, are poverty, unhealthy way of living related to malnutrition, constant distress combined with other risk factors such as smoking, alcohol dependancy, drug dependancy, low motor activities, etc. On April 5. 2011 the European Commission announced Communication "EU Framework for National Roma Integration Strategies". Within it the Commission required all EU member states to submit National Roma Integration Strategy until December 31.2011. Later. the draft of new European Social Fund (ESF) Regulations proposed by European Commission on October 6.2011 stated the existence of NRIS as ex-ante conditionally for every EU state for participation in ESF absorbtion. Following this requirement all Member States (exept Malta) submitted their documents until the end of March 2012. In late November and early December, when thousands of tourists made reservations for Southern Mexico and Guatemala, hoping to see the end of the world, predicted of the Mayan in their country, representatives of Amalipe and 6 organizations from Macedonia visited Guatemala . The visit was organized by the Centre for Equality and Health System Study(Centro de Estudios para la Equidad y Governanza en los Sistemas de Salud - CEGSS) in Guatemala and the "Open Society Institute" - New York. It was not part of the flourishing tourist industry related to the end of the world expectations "appointed" for December 21 2012. We visited Guatemala looking not to the past of the ancient Maya, but to their descendants’ presence; we did not expect the end of the world, we saw how the community monitoring of health services in indigenous communities at a grass-root level is and will continue to be made. "El Corazon del mundo Maya" - "The heart of the Mayan world" with this sentence Guatemala welcomes thousands of tourists every day landed at the airport in Guatemala City. Accompanied by a photograph of the pyramid of Tikal, the sentence shows that the country keeps the ruins of the most ancient cities of an ancient civilization that captivates the minds of millions around the world with its splendor: the most accurate calendar in the world, exceptional knowledge of mathematics, amazing architecture, unique in its depth in space vision and mentality. Guatemala is a country of contrasts. It greeted us with colours woven on looms by skilled female hands, which do not miss the thread of tradition; colors, tucked in the skirts, in hair and in the hospitable people’ smiles, regardless of grayness of hopelessness in which they live. On the first day we were in the heart of this color - Chichicastenango market, which striked us with its syncretism: religion, traditions, languages, beliefs, and most of all - the ability to preserve the richness of their culture and ... to survive. You can feel it just standing in the center of the market, close your eyes and just listen - buzz, intonation, blend of languages ​​and dialects ... You can see it when you open your eyes and look up - not to the Lord – the Gods, Christian or pagan seems to have forgotten these people, even though they desperately and persistently try to pray for their blessing in pagan and Christian way. In the center of the market is located the big Catholic church of Santo Tomas. In the past - in that other time – it has been mayan temple. The stairs to the entrance were also strewn with colours - not by the flowers that women sell but by the diversity of their clothes. Men and women were kneeling everywhere - in the church, around the church, in the foot of the church and quietly whispered pagan and Christian prayers, burned incense and herbs, offered gifts in sacrifice, crossed themselves and quietly returned to their everyday lives. We squeezed through the narrow gaps between stalls dotted with colorful hand-woven clothes that are an attraction for tourists, but for locals they are more than life - livelihood, necessity, tradition that women are trying hard to preserve in order to convey the vanishing proud to their children and to preserve their identity. The whole newsletter can be downloaded here. Assesment of Amalipe Center for Interethnic Dialogue and Tolerance. Identity is always an issue of construction. It is constructed on the basis of certain / different phenomena with regard to certain / different trans-human realities. And it is constructed by diverse players not only within the groups to which the identity refers to but also within the surrounding groups. Pre-modern identity is constructed on the basis of cultural practices and religions that are common for certain groups of people and are practiced with regard to their relations with Nature and Super-natural. The modern times brought History and Territory into the game; that is why modern identity is usually constructed by certain territorial and historical (including social) myths with regard to the State. It does not abolish the previous cultural practices and religion (or at least this is not the frequent scenario) but usually uniforms, simplifies and transforms them to serve the territorial and historical myths. It is too early to say what the post-modern identity will add. Most probably it will be constructed with regard to the relations to certain segments of trans-national power. At present, Roma community passes crucial period of its development: transition from pre-modern (patriarchal) to modern society. This transition is always painful and difficult but at the same time it provides unique opportunities for either moving the groups at a higher stage and position, or dissolving / assimilating it. In Europe this transition was called Enlightenment, Renaissance, Modernization; for Roma it is called Integration. An important factor that makes it even more painful and difficult is the fact that it happens in countries and societies that are on the borders of post-modernism. The pre-modern, traditional Roma identity does exist although it is mainly at the level of Roma groups and clans, i.e. it is more “identities” than “identity”. Certain Roma cultural practices are common for certain Roma / Gipsy groups, some of them – to many Roma / Gipsy groups. For example, the celebration of St. Basil’s Day as the beginning of New Year or the celebration of St. George’s Day is common for almost all Balkan groups. The legend for the Egypt origin is another example. The biggest challenge before Roma today is the construction of modern identity. Certain questions should be answered. For example, whether a Roma identity or different (Roma, Millet, Rudari…) identities will be built? Whether this identity will abandon the previous (traditional) cultural practices or will unify, simplify and transform them? On the basis of which territorial or historical myths the modern Roma identity will be constructed? HRV is a comparatively new topic for Bulgarian society. For Bulgaria HRV and its extent is a hidden phenomenon. The issue of HRV is at the intersection of several human rights problems, which characterize the Bulgarian reality as well- the problem of women’s rights and violence against women, of child’s rights, of social-economic rights and the marginalization of some vulnerable groups of the society, of religious rights and stereotypes and the clash of some traditional practices with the universal human rights, etc. Moreover, the Balkans are a place where violence is part of the growth of children, ie corrective measure. The same refers to some traditional groups like the Roma community. It is considered an element of the normal course of life having a number of traditional sayings and proverbs related to it. One of them, for example, is “Beat your daughter now, not to beat your head later”. The Health Status of Romani Women in Bulgaria. The idea for the present report appeared to feel a gap existing regarding Romani women health situation in Bulgaria. Only few peaces of data are available regarding Romani women situation. They are even fewer concerning Romani women health status. At the same time, dynamic changes in the health system in Bulgaria in the recent years affected mostly Roma. This necessitates a study "mapping" the situation. The present research does not pretend to be an exhaustive study but it sets a frame that should be additionally filled up in the future. The authors will be happy if the present research provokes other research teams to continue and extend this work. The research aimed at revealing the heath status, problems and needs of Romani women in Bulgaria with respect to factors such as type of settlement, Romani sub­group they belong to, age and marital status which would create a clearer picture. A tailored approach has been extremely important because the specifics of the different sub-groups within the Roma community, for example, define different problems. More­over, the different Roma groups due to the difference in the intensity of their contacts with the macro-society are at a different level of modernization which also influences their attitudes towards various issues. At the same time, a number of factors have an impact on forming the perceptions and concepts of the members of a community: religion, type of settlement, type of family, educational level, socio-economic status, and so on. This could result in diversity even within a single Roma community and in contrary situation in two neighboring settlements. Assessment of the National Strategy of Republic of Bulgaria for Roma Integration approved by the Council of Ministers on December 21, 2011 (with Decision 1/05.01.2012). 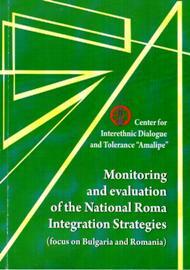 The Assessment is prepared by AMALIPE Center for Interethnic Dialogue and Tolerance in February 2012. It is submitted to DG JUST of European Commission following call for public contribution in assessing the National Roma Integration Strategies. The project “Combating social exclusion of Romani women” was financed by the Roma Initiatives Program of Open Society Foundation as complimentary to the project “Preventing Early/Forced Marriages” financed by the European Com-mission under Daphne III program. It addressed three main problems. The first one was social exclusion of Romani women in Bulgaria and the other countries of South-Eastern Europe. Romani women in Bulgaria face deep exclusion from the social, economic and public life as well as double discrimination (once as Roma and another time as women). Their educational, social and health status is disadvantaged not only compared to the one of majority women but also compared to the status of Roma men. The second problem was the existence of harmful practices in some traditional and marginalized Roma families that prevent raising the educational and social status of Romani girls and women: such as early marria-ges, forced marriages, etc. These practices still persist in some Roma groups and the efforts of young Romani women leaders to overcome them do not meet real support from the state institutions. The third problem was the lack of comprehensive policy for combating the social exclusion of Romani women: at national and even at European levels. Although special Resolution on the situation of Roma women in the European Union was approved by European Parliament in June 2006 it was not continued by efforts of the member-states to establish comprehensive policy for overcoming the social exclusion of Roma women. European institutions do not continue their efforts in this direction and the attempts of national Romani women activists until now are relatively weak and unsuccessful. PROJECT „PREVENTION OF EARLY/ FORCED MARRIAGES"
The project is carried out by Center for Interethnic Dialogue and Tolerance "Amalipe" - Bulgaria (leading organization), Liga Pro Europa - Romania and the Association for Social Support ofYouth ARSIS - Greece (partners). The project is supported within the DAPHNE III 2007-2013 Program of the European Commission. 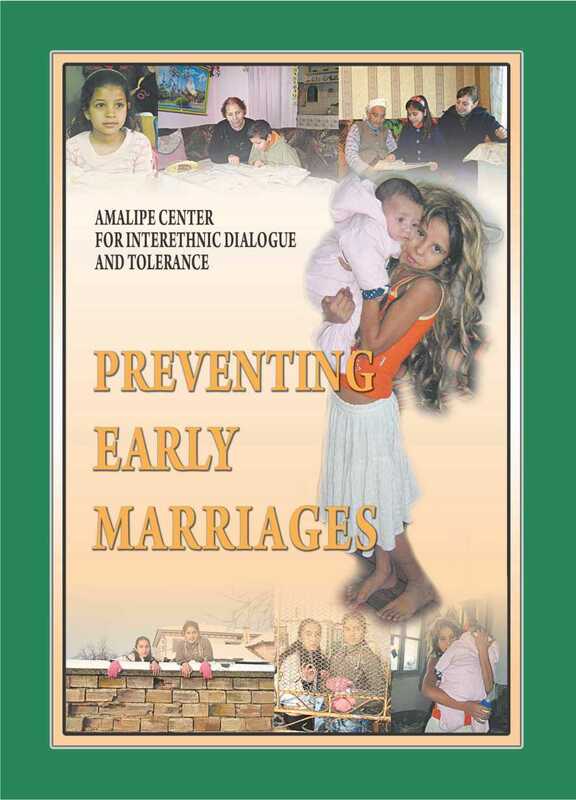 Study of the problem of the early and forced marriages: Since no specific research of | the early marriages in the Roma community has been made until now and the project needs reliable data on this problem, a study of the phenomenon of the "early marriages" in Bulgaria, Rumania and Greece is planned in the first months of its implementation. This study includes sociological research of the marriage attitudes of Roma people in Bulgaria, survey of the legislative and institutional frame, referring to the problem in these three countries as well as a study of the attitudes of the on- field workers in order to have a reliable picture of the situation, the attitude of the different parties, concerned with it and the possible ways for finding issues. The present reports includes the main findings of the research of the effect of the implementation of Human Resources Development OP, Regional Development OP and Rural Areas Development Plan on the Roma community and the process of Roma integration and recommendations for improvement of the programmes - their implementation, and the respective programmes for the next programme period. The report could be a heuristic base for optimization of the implementation of the programmes until the end of the current programme period, as well as for changes of the texts of these programmes. The report proposes main ideas for elaboration of the analogical programmes during the next programme period for the needed bounding with the process of the Roma integration. The authors believe that the process of development of new operational programs will be crucial to accelerate the integration of Roma and hope that civil society organizations and Roma community will actively participate in this process. The report covers 2007 and 2008 and the first months of 2009. The report makes an analysis and assessment done and achieved in four key areas of Roma Inclusion: education, health, housing, employment social services. Examined is also the overall regulatory, administrative and financial framework of the integration process. The report is the result of year-round monitoring of what is happening in those areas as well as the activities of the Ministry of Education and science, Ministry of Labour and Social Policy, Ministry of Regional Development, Ministry of Health, National Council for Cooperation on Ethnic and Demographic Issues, "Ethnic and Demographic Issues” Directorate at the Council of Ministers and other institutions at national, regional and local level. The report is a result of research implemented nationally and locally (in 12 municipalities in the six planning regions of Bulgaria). The survey was organized by the Center for Interethnic Dialogue and Tolerance Amalipe”, whereas 16 representatives of Roma NGOs and experts from across the country participated. The findings and conclusions were discussed with a wide range of Roma organizations and institutions concerned with the issue. 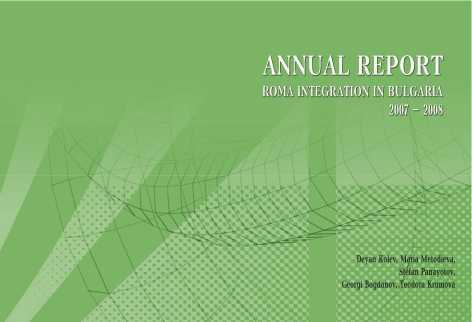 Annual report “Roma Integration in Bulgaria – 2006” prepared by Center “Amalipe” was recently published. It concerns the main trends in Roma integration process from January to December 2006 with accents on education, social policy, living conitions, connecting EU accession with Roma integration and gender equality. Special attention is paid to institutional an normative framework for Roma integration at national, regional and local levels. Deyan Kolev, George Bogdanov, Maria Metodieva, Teodora Krumova and Boyan Zahariev are the repor authors. The report combines results from permanent monitoring of the daily activities of certain national institutions with results of field survey about the state of Roma integration in 17 municipalities all over Bulgaria realized by Center “Amalipe” and 8 other Roma NGOs.